NEW! A weekly planner, now available in a sturdy wire-bound version! 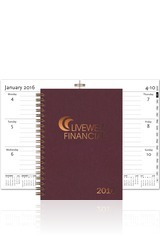 Available in 4 x 6 and 5 x 7 sizes, and each includes a weekly planner with a month-at-a-glance at the start of each month. Call for higher quantities. Setup fee of $52.50 G. Price includes 1-color foil imprint up to 16" sq - no bleed. Standard turnaround 10-15 business days from proof approval. Actual pre-production sample available for $112.50 G.